Unlike the hard right I have not conjured up an imaginary Other, but identified a genuine adversary in a struggle over democratic liberalism that is already engaged. 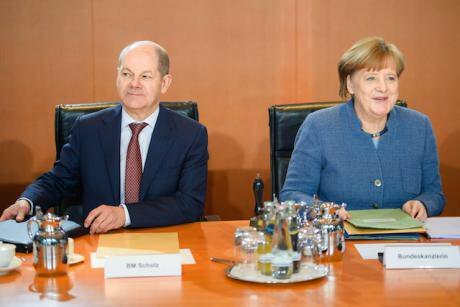 28 March 2018, Germany, Berlin: Olaf Scholz, Federal Minister of Finance (SPD), and German Chancellor Angela Merkel (CDU) attend a cabinet meeting at the Federal Chancellery. Gregor Fischer/Press Association. All rights reserved. To fix the topic, recall 18 months of recent electoral shocks, in reverse order. Last autumn in Germany’s national elections, the Alternative für Deutschland broke out from the fringes and won 94 seats in the federal parliament, a seventh of the total. Not since the early 1950s has Germany’s hard right won national representation and never in such strength. A year ago, Marine Le Pen at the head of the National Front advanced to the second round of France’s presidential election, beating conventional parties of center-left and center-right. Although she lost the run-off, Le Pen won 34 percent of the second-round vote, a popular breakthrough for a party previously contained at the extremes. In the 2016 US election, the New York property developer and television showman Donald Trump, running a right-wing “America First” campaign as a maverick Republican, won the presidency with a minority of the popular vote but a large majority in the electoral college. And not to forget, in June 2016, 51.9% of those voting in a nationwide referendum called for Britain to leave the European Union without specifying an alternative to membership and despite the near-unanimous collective finding of mainstream politicians left and right, business leaders, economists, historians, scientists, military specialists, and foreign-policy experts that withdrawal would prove an economic, social and strategic blunder. Four countries, four frameworks, four results, all different and each telling its own story. You could say that and up to a point, you’d be right. But rather than the contrasts, I want to stress the similarities, which alarm me, as I suspect they alarm many or most readers. What I fear we’re looking at is a hard right that has resurfaced and established itself in the western political mainstream. Its starkest elements are exclusionary nativism, doctrinaire libertarianism and a perverse appeal to the popular will. However ill-sorted with each other – and I’ll come back to that – those elements together threaten democratic liberalism, or to use the standard label, liberal democracy. If we’re to resist the threat, as I think we must, it’s urgent to understand what the hard right is and where it comes from come. There are purer, more dominant forms of the hard right elsewhere in Europe. But I focus on these four countries because I’ve worked and lived in all of them, because they’re a representative core and because the survival of liberal democracy depends directly on its health in this core in a way that it doesn’t depend as directly on what happens in, say, Austria or Poland. I talk about the hard right not new right because its slogans, themes and appeals are old. They go back through the twentieth and nineteenth centuries to historic splits on the conservative right, back in fact to conservatism’s never-resolved ambivalence about capitalist modernity and hence to its original quarrel with political liberalism. I talk about the hard right, not the far right, because “far” suggests fringe and the hard right has left the fringe to become a normal part of the political contest. Under a Ukipped Conservative party, the hard right is in office in Britain, though it would be charitable to call it in control. In the United States, a radicalised Republican party dominates the three branches of federal government, 32 of the 50 states legislatures and 33 governorships. Although so far successfully barred from government in France and Germany, the hard right has there a large and enduring popular following. As the Dutch expert on the hard right Cas Mudde nicely puts it, a normal pathology has become a pathological normality. In plain terms, the hard right isn’t weird or extreme. It’s popular and normal. Indeed, it’s alarming because it’s popular and normal. As briskly as I can, I’m going to make five claims: first, despite national differences, the hard right has a common character that we can see in the discordant interests of its coalition partners, in a shared repertoire of rhetorical appeals and in a radical willingness to upset familiar norms and arrangements all at once. Second, none of that is new or original. Those awkward alliances, stock themes and a taste for radicalism are all traditional on the right. They go back through the 1960s-70s, 1920-30s, 1890-1900s to conservatism’s original struggle to reconcile itself with capitalism and democracy. My third claim requires a sideways glance at two misleading labels. Despite its historic roots and despite sharing elements of a common ancestry, the present hard right is not fascist. Nor is it populist in the loaded and erroneous sense that contrasts parties of elites with parties of the people. My fourth claim, back to the main track, is that the present resurgence of the hard right is a consequence of long failure by the liberal centre to keep democratic liberalism in good repair. And finally, I claim that though the hard right has indeed captured government in Britain and the United States, it has so far been held at bay in France and Germany because liberal democracy is there in better repair. Liberals of right and left need to unite against the hard right – and if non-liberals of the left join in, so much the better. Amid the claims and definitions, my red thread is a political message to which I trust everything else runs: liberals of right and left need to unite against the hard right – and if non-liberals of the left join in, so much the better. As a defendable frame of modern politics, democratic liberalism for all its flaws, inequities and disappointments, is without actual equal. It’s in bad need of repair. The hard right is happy for it to fall apart. The rest of us mustn’t let that happen. So, one, for the hard right’s common character. It’s everywhere an unnatural pairing of small-government, socially permissive libertarians who favour economic globalisation and nativist conservatives preoccupied with cultural identity and national decline. The libertarians are typically self-assured, border-blind people who deny the need for social anchorage: the nativists disoriented and resentful people who crave social anchorage. Both claim to speak for that imaginary being, the people, against what they call the elites. The libertarian right claims the people will be better off once freed from the grip of a big-government political class. The nativist right claims the people will be better off once freed from the grip of out-of-touch, foreigner-friendly cosmopolitans. In terms of policies, the hard right’s undeliverable common programme promises bigger government hand-outs and lower taxes, help for working people and a free hand for business. Similarly, the National Front in France under its first leader, Jean-Marie Le Pen, combined a xenophobia that attracted bigots and free-market economics that drew small businesses, distinct but overlapping categories. When his daughter, Marine Le Pen, took over in 2011, she set out to “dedemonise” the party by toning down the bigotry. She talked up wages and welfare to win working-class votes, and better security amid terror to win centre votes, while continuing to appeal to the prejudices of the party’s base in code. Her formula worked well in the presidential contest, poorly afterwards in first-past-the-post elections to parliament which punish small parties. She fired her right-hand man, Florian Phillipot, who wanted to cut the party loose from its bigots and move without baggage to win the mainstream. The same unnatural chemistry is to be seen in the Anglosphere. Trump and the Republicans claim to help the little guy without hurting the rich. The Conservatives in Britain promise to help struggling middle England. “We do not believe in untrammeled free markets,” their party manifesto read last June, “We reject the cult of selfish individualism. We abhor social division, injustice, unfairness and inequality.” Yet they continue to squeeze public spending and favour their rich donors. Looking for resolution of those tensions in reasons and argument is looking in the wrong place. The hard right has skilled, articulate expertise on hand to justify this or that policy, but its appeal relies less on thought-out views or principles than on a beguiling set of rhetorical themes. This common repertoire of stories and pictures about the state of politics is the hard right’s second distinguishing characteristic. Not only is the repertoire seductive on its own. It serves also to mask the programmatic incoherence and conflicting interests among the hard right’s electoral supporters. The first rhetorical theme, heard in all four countries, is decline. The decline that the hard right talks of is not at all the institutional and economic disrepair that chiefly concerns democratic liberals. It is not the failure to eradicate wrongs or achieve common goals, but a deterioration in social and moral health. Our once strong nation, we are told, is in decay. A once cohesive society has been fractured. A once virtuous people has grown decadent. Decline is presumed in Trump’s slogan “Make America Great Again”. An appetite for tales of national ruin made bestsellers of Eric Zemmour’s book The French Suicide (2014) and Germany’s destroying itself (2010), by an ex-central banker, Thilo Sarrazin. Capture is another theme. In the narrative of national decline, politics and government have been captured by self-serving elites who neither understand nor speak for the people. Trump promises to “Clean up the Swamp”. The National Front blames France’s troubles on a corrupt “classe politique” in Paris. The AfD poses as the necessary replacement for unrepresentative and exhausted parties of centre-left and centre-right that are stifling, Germany’s national energies. Decline and capture were together invoked in the Brexit Campaign. Europe has corrupted upright Britain and, aided by the nation’s Europeanised elites, taken its constitution prisoner. Brexiteers promise to “Take Back Control” from Brussels, to use their lazy metonym, and its “unelected bureaucrats”, their idle pleonasm, as if in executive-dominated Westminster, the cabinet secretary or the head of the Treasury had ever run for anything. The flipside of capture is deliverance. Here, too, the hard right has a story. The true nation or – to give it the name the hard right uses interchangeably, the people – are unspoken for at present and powerless. The common institutions of state and society – government, media, universities, courts – have fallen into unrighteous hands. If the nation can free itself from those hostile elites, a redemptive liberation awaits. The enemies of the nation, inside and out, provide a final theme. The inner enemies of the nation are liberals. They work for themselves, not for the people or nation. Whether the defining moral flaw of the liberal shows itself as greed, godlessness or a lack of patriotism, the liberal is self-interested to the point of amorality, lacking final or lasting attachments to anything beyond the sphere of their own aims and preferences. The captors without are other nations, foreign entanglements, international commitments. “Our nation first” is so common a cry that the hard right is often called nationalist, though that is a mistake. The hard right is internationalist. It grasps that the nation-state is in the world and must work with the world. What distinguishes the hard right is that it wants the nation to work in the world on the nation’s own terms. The hard right abandons multilateralism, that is, for the fantasy of unilateralism. Nor is the hard right nationalist in the nineteenth-century sense of putting duty to nation above all other public duties, not least to the duty of creating a nation when one is missing, as it was, say, in Italy or Germany. Quite the opposite, the hard right is preoccupied not by what we owe the nation but by who belongs in the nation and who may be kept out of the nation. The hard right abandons multilateralism, that is, for the fantasy of unilateralism. It clings, for that reason, to an exclusionary idea of the nation as ethnos, not demos, to an idea of nation as birthright, shared origin and historical continuity, not of nation, understood inclusively, as common citizenship and shared commitment to a necessary minimum of civic norms. To cast the difference between the hard right and its opponents here as an argument about immigration is doubly false. Not only, to state a banality, is immigration many issues rather than one – legal, social, economic, ethico-cultural, demographic. Every nation should be able to say who and who is not to be a citizen, as well as what may be required of anyone who is a citizen. However, no nation – no liberal-democratic nation at any rate – should make decisions about citizenship or police its borders on the grounds of irrelevant, discriminatory notions of the kind of person who belongs in the nation. Simply put, there are liberal-democratic and nativist ways to argue about immigration and it’s important to be clear about which argument you’re in. Whether heard as “France d’abord”, “America First”, “Trust yourself, Germany” or “Take back control”, the hard right’s exclusionary cry is not nationalist, let alone patriotic. Boastful but insecure, the hard right is unilateralist towards the world and nativist towards the nation. Boastful but insecure, the hard right is unilateralist towards the world and nativist towards the nation. The rhetorical theme tying those others together is victimhood. Like the nation it defends, the hard right is victimised by usurping forces. The hard right gives voice to the people, but its voice is not heard. The majority is silenced, for only a minority speaks – the unrepresentative liberals who dominate politics, media and universities. In weakness, however, lies strength. For oppression defeats itself and virtue in the end prevails. The idea of righteous suffering has impeccable religious pedigree, but it is not only among Christian conservatives that the theme of victimhood has political appeal. Victimhood serves on the hard right more generally to bridge the divide that separates its two large bodies of support between privilege and wealth on the one hand and resentful dispossession, whether cultural or economic, on the other. Both parts of the hard right’s unnatural coalition can be presented as victims, the ones victims of a grasping, intrusive state, the others victims of hypocritical, indifferent liberals, who do nothing for the poor and impose their own permissive ethics. In its preferred style of argument, the hard right feels accordingly most at ease when posing political issues as questions of loyalty or disloyalty. Are you one of us or one of them? Are you with us or against us? It’s as if the hard right were seeking to confirm what Carl Schmitt, the conservative German constitutional lawyer who later fell in with the Nazis, wrote in 1927: “The distinction specific to politics…is that between friend and enemy”. As the philosopher Bernard Williams remarked of it, Schmitt’s claim is in one way banal and harmless. All politics involves parties and camps. All politics involves competition and conflict. In another way, however, Schmitt’s claim was neither banal nor harmless. For it appeared to turn politics into a special kind of conflict, namely warfare. If politics inevitably sets friend against enemy, civic unity would require not shared principle but an external foe. Civic diversity would have to be thought of not as a clash of bargainable interests and containable arguments but as low-grade civil war. If politics inevitably sets friend against enemy, civic unity would require not shared principle but an external foe. In its taste for melodrama and stigmatisation, the hard right’s friend-enemy talk is characteristic. Even on matters of workaday politics and administration, the hard right’s publicists fall back on the lame argumentum ad factionem: p is false because liberals say p.
Though seldom as well-wrought, its scorn and vituperation draw on a fine tradition of anti-modern invective that goes back to Maistre, Baudelaire, Nietzsche and Mencken. The hard right is vehement, hot and angry, qualities which cause it pride, not shame. When liberals quail and fall silent before its bellowing, the hard right doesn’t think it’s lost the argument. On the contrary, it senses it has won. The hard right's final characteristic is a radical willingness to unravel long-standing arrangements all at once. If, as conventionally assumed, it is in the nature of conservatism to prefer the status quo and favour gradual change, then the hard right is not conservative. In the United States, Trump’s diversionary theatrics and comparative failures in Congress have kept off the front pages a bonfire of social and environmental regulations as well as a purge of liberal judges from the federal bench that continue in the background with little resistance and that will play out for decades. Internationally, the unconservative revisionism of the hard right is evident in Trump’s questioning or pulling back from previous American commitments –the Iran nuclear deal, world climate accords, the western alliance itself. Rather than standing up for liberal democracy and universal values, he praises authoritarians: China’s Xi, Putin, Saudi princes, Dutarte. Rather than follow every administration, Democrat or Republic, since 1945 and align Americanism, westernism and universalism in an avowedly virtuous trinity, the Trump right detaches Americanism as defendable on its own. In Britain, international revisionism has packed itself into the self-destructive nuclear option of Brexit, with its promise of uncontainable fallout. A party that once boasted the lawyer, David Maxwell Fyfe, later Lord Chancellor, who drafted much of the European Convention on Human Rights, is now led by a politician who has toyed with withdrawing from its jurisdiction and who told her party conference, in a shameful, illiberal phrase, that to be a citizen of the world was to be a citizen of nowhere. Appalling as that all is, none of it is new. The themes of the hard right were heard in the 1960s-70s. Recall if you will Richard Nixon’s use of them when winning back George Wallace voters and appealing to the Silent Majority, which created Nixon Democrats, who became Reagan Democrats and who were then rediscovered in amnesiac surprise as Trump Democrats. Recall Enoch Powell, that British free-marketeer and imperial nostalgic who combined polyglot high intellect with a perfect ear for English unreason. Writing of him in 1968, the Daily Telegraph’s leader writer, Tom Utley judged that the Tories would be dealing with Powellism for the next decade. Utley would have been spot on had he written “for the next 50 years or more”. The hard right’s themes were heard in the 1920-30s. Trump’s “America First” slogan was borrowed from the non-interventionist “America First Committee” of 1939. The rabble-rousing governor of Louisiana, Huey Long, and the right-wing Catholic radio-priest Father Coughlin, promised, as do Republicans today, to help the little guy without hurting the rich. In the 1920s, a tidied-up Ku Klux Klan campaigned in Washington for discriminatory immigration laws. In Germany, a best-seller, The Third Reich (1923) by a literary malcontent Moeller van den Bruck told disoriented readers that liberalism was the played out “death of nations” and called on the young to embrace an exhilarating but unspecified collective alternative. They were heard in the 1890s-1900s. The French ultra-rightist, Charles Maurras supplied the hard right with another favoured theme when distinguishing the “legal nation” from the “real nation”. The legal nation, Maurras wrote, had been captured by an enemy within: liberals, Jews, free-masons and “métèques”, that is wogs. Genuine members of the French nation, he believed, were monarchist and Catholic heirs of Graeco-Roman civilisation. In Germany in the same period, the ultra-conservative Prussian newspaper, the Kreutzzeitung, stigmatised the anti-clerical liberal – often Jewish, it noted ­–as an enemy within who had undermined what previously bound together the nation, namely Christian faith, albeit not Catholic but Lutheran. In the United States, the hard right was less bookish and doctrinal, but no less fierce. Campaigns against Masons, against Catholics and against Jews were a constant feature of nineteenth- and early twentieth-century politics, not to forget pervasive anti-black racialism, whether legally encoded or socially prescribed, in the north as well as in the south. In Britain, the anti-liberal right spoke in softer tones, but the learned and Christian Conservative leader, Lord Salisbury, was unshaken in his bleak belief that liberal progress was impossible for fallen humanity. I list all that not from antiquarian curiosity but because the hard right has old and nourishing roots for a reason. Its present resurgence is the latest manifestation of the right’s original and unresolved ambivalence about capitalist modernity. The primal contest with which early in the nineteenth century modern politics began to set liberals against conservatives over urbanised, industrial capitalism. Liberals greeted capitalism as a bounteous machine for spreading prosperity. The machine turned society continually upside down. But liberals trusted to political means for controlling and harnessing the ceaseless change. Power ­– be it the power of state, wealth or social orthodoxy – could be controlled if divided and not allowed to dominate or coalesce. Material betterment together with widespread education would ensure that human change was progressive and beneficial. Modern, self-possessed citizens demanded and could soon expect unquestioning forbearance from the powers of society, a civic respect gradually entrenched in law with personal, property and political rights. Such were the promises of liberalism, which were grudgingly extended democratically, bringing in time the avowed aim at any rate of a political say for all, a better economic share for all and an ethico-cultural voice for all. That historic compromise between liberalism and democracy, ever incomplete, ever open to renegotiation, underlies what I’ve been calling democratic liberalism. That historic compromise between liberalism and democracy, ever incomplete, ever open to renegotiation, underlies what I’ve been calling democratic liberalism. It never won an unconditional embrace from conservatives. Through the nineteenth century, conservatives fought a long, strategic retreat against market capitalism and mass democracy in defence of tradition, hierarchy, deference and orthodoxy. By the late nineteenth century, conservatism faced a divide. Conservatives who wanted to stay in the mainstream with hopes of governing had abandoned their previous fight. In a lasting practical concession, they accepted capitalism and electoral democracy. They became, in effect, business-minded liberals. They joined or merged with existing liberal parties of the right keen also to resist the rising new force in politics, organised labour. In time, together with their right-wing liberal allies, pragmatic conservatives made grudging peace with economic democracy and cultural democracy. They abandoned, that is, resistance to “socialistic” government that taxed incomes and protected unions in law. They abandoned claims to moral and aesthetic tutelage. They accepted that liberal promises – a voice in politics, a share in wealth and assurance of moral privacy – were to be extended democratically to everyone, whoever they were. Pragmatic conservatism, however, never wholly shed its foundational beliefs: in the essential harmony of society, in the nation as a shared ancestry and common culture, in their fellow humans as imperfect, dependent creatures ill-adapted to self-government, not much improvable and in need of strong authority. Conservatism never discarded, that is, a picture of society, politics and people that, fairly or unfairly, could be counterposed to the flawed liberal picture of power constrained and yet social order achieved among independent-minded, progressive citizens. For liberals, it was complained, overplayed the authority of personal choice and the social fruits of rational self-direction to the neglect of unreasoned attachment to nation, faith and custom. Liberals exalted private judgment of what was good in life while discounting things of worth or excellence in themselves regardless of who favoured them. With intellectual force and eloquence, conservative thinkers and writers from Chateaubriand, Coleridge, Bradley, Gierke, Eliot and Oakeshott through to Roger Scruton and Patrick Deneen in our time have refined that conservative critique of liberalism. Or to put it more exactly, they have refined a critique of what they claim political liberals must philosophically subscribe to, which is not quite the same thing. At that late nineteenth-century watershed, unpragmatic conservatives who refused to compromise remained open foes of liberal democracy. They stayed in politics as a radical, disruptive fringe. Like pragmatic conservatives, the radicals kept alive old conservative attachments – to nation, faith, authority and custom – but turned them to exclusionary and polemical purpose. Thematically, they put a beguiling Romantic tale of national deliverance to villainous political use, in Germany with ruinous consequences. The tale went like this: The nation is ailing because it is morally split. It cannot heal itself but needs a visionary guide who can restore it to health in redemptive unity. Such a tale, well known to students of the apocalyptic mind, is bound in the context of the twentieth century to make us think of fascism and Nazism, but I want to be very clear about what I’m not saying. The hard right we face is not fascist or, save on the fringes, proto-fascist. The themes and anger of the unreconciled right of the 1890s-1900s amply fed fascism. Fascism was indeed a form of the hard right. But there are many hard-right forms besides fascism. Fascism was historically specific. It sprang up in Italy in the 1920s, after a ruinous world war without European winners. It relied not only on a cult of the leader and a totalizing vision of society, but on a unifying Bolshevik enemy and a single, mass party. Although it won power through the ballot thanks to the irresolution of constitutional authorities, fascism embraced illegality and violence as acceptable methods of politics. Nazism in Germany added the toxic element of anti-Semitism. Nowhere in the four countries I’m talking about are those elements to be found together or as yet in dangerous strength. That is not to say the hard right could not in calamitous circumstances become fascist or some latter-day equivalent. When peering into the political future, “can’t” is best avoided. The thing to be clear about is that the hard right need not be proto-fascist to cause us alarm. There is a political point here to what may otherwise sound like historico-conceptual quibbling. The complacency is often heard that frightening as it is, the hard right is not fascist and that we therefore shouldn’t overdo the threat. Well, yes to the first, but not to the second. Fascism is not the only way liberal democracies can weaken or end. Liberals have plenty to disturb their sleep without misfiling the threat. Fascism is not the only way liberal democracies can weaken or end. Liberals have plenty to disturb their sleep without misfiling the threat. The hard right is more convincingly called populist, but that label is itself open to misinterpretation. Populism, properly understood, is not a mass movement, an institutional arrangement or a form of democracy but a style of political self-justification. To use its own contentious language, populism is an elite phenomenon. It involves not a contest between people and elites but a contest among elites in which one side, the populist side, claims to speak for the people. Right-wing populists claim to defend a virtuous nation, often ethnically imagined, against corrupt establishments and menacing foreigners. Left-wing populists claim to defend the working people against corrupt establishments and the rich. Right or left, populists tend to be political outs exploiting electoral odium against the ins. As insurgents they often upset familiar party patterns, lending force to the sly definition of “populist” as what losers call winners after an unexpected electoral defeat or sudden collapse of a well-established party. Populists may form a new party or capture an existing party, as in Britain the Brexit minority did to the Conservatives and Corbyn’s hard-left backers did to Labour, or in the United States as hard-right insurgents did to the Republican party. Whichever populists do and however loudly they speak for that mythical being, the people, they are activists, usually of the same background and education as the rivals in power they aim to displace. However loudly they speak for that mythical being, the people, [populists] are activists, usually of the same background and education as the rivals in power they aim to displace. If winners at the polls, populists take victory to show definitively the people’s will, despite the fact that no electoral majority is stable, none are immune to reversal at the next election and, when misleadingly taken as expressing a coherent point of view, all are statistical constructions from often discordant voices. In office, populists tend to bully critics, favor cronies, and attack judges whose rulings they dislike. Once that is grasped, it is fair to say that Trump and May are behaving like populists. So much for what the hard right is and isn’t. I say no more in defence of my fourth and fifth claim, save to repeat them. The hard right has got where it has and we’re in the mess we’re in because of liberal democracy’s under-repair. We had something valuable we have risked letting slip away. No fair-minded or open-eyed observer could say that actual present-day democratic liberalism was free of social injustice, cultural loss and unmet need. Nobody need claim that it is democratic enough, that is to say that it is liberalism for all, not liberalism for too few. Nobody need see democratic liberalism as a historical terminus let alone an ideal society. Having said all that, it is vital to acknowledge something else that is also true. After 1945 in Europe and the United States, a frame of politics was established in which the gap between avowed aims and actual achievements became measurable, discussable in practical terms and to a degree closeable. Failures and wrongs, to put it simply, were identified, cures attempted and, despite an ocean of right-wing denial, cures achieved. The same is no longer true. To stick with home, the troubles and inequities of Britain are well known: post-crisis stagnation in living standards, prolonged fiscal austerity, housing shortages, undue inequality, generational and regional divisions. Public goods needed for an efficient economy and flourishing society that markets do not provide are undersupplied. Government at all levels is suffering from a long decline in prestige and effectiveness. Government at all levels is suffering from a long decline in prestige and effectiveness. The causes are many and complex. They include the complexity of modern government and its inevitable proneness to mistakes. But they include also a flawed doctrine that many policymakers, business schools, university departments and economic journalists swallowed whole in the 1970s-80s. Despite its technical sophistication, the doctrine could without caricature be reduced to the slogan “Markets work, governments don’t”. The doctrine was seized on by parties of the mainstream right despite their professed hostility to social engineering. The doctrine was adopted by parties of the centre left and became an administrative orthodoxy. It was pursued in radical disregard for social costs and unintended consequences, long after its original justification – the many-sided fiscal crisis of the 1970s – had passed. For decades of policy-led social and economic experimentation, the political centre began in the 2000s to pay the price. The Iraq War (2003) and the financial crash (2008) further drained public trust in the centre’s governing competence and grasp of affairs. We are living with that loss of confidence. We are angrily divided as a people and misgoverned by fools and scoundrels. Many know they are leading the nation to disaster. Many know we are turning our backs on the world’s most hopeful experiment in post-national liberal democracy. Yet they cannot find the courage to say “Stop!” Yet they cannot find the courage to say “Stop!”. Contrast Germany, with which we began. Angela Merkel’s Christian Democratic party (with its Bavarian sister, the Christian Social Union) dropped in last autumn’s election to 33% of the vote from 41.5% four years ago. The center-left Social Democratic Party won 21%, a post-1949 low. Anger at the mainstream was evident. Yet, electorally, the centre has so far held. Unlike Britain, Germany has mixed constituency-and-proportional voting. Of the constituency seats, the Christian Democrats won close to two thirds. The hard right was confined to three or four in Saxony, always a fractious corner of the German empire. The German centre held at the polls because, for all its problems and despite the hard right’s claims of national ruin, the country is doing well. Unemployment is low, its public finances are strong, its economic growth steady. It has taken in 1.5m refugees in recent years and over the past generation integrated 20m fellow Easterners with such calm and success that an extraordinary achievement is taken for granted and virtually forgotten. Against that background of stability, the political crisis in Berlin, when the Free Democrats withdrew from coalition talks with the Christians Democrats and Greens over continued federal support for eastern Länder, shocked an already shaken Europe. Yet the stabilisers of German politics – preference for co-operation, knowledge of the past and impatience with doctrine – remained in play. A fourth mainstream party that had forsworn working with the hard right, the Social Democrats, earlier this year reconsidered its initial refusal to enter a coalition with Chancellor Merkel. We’ve come to the present. Amid fluidity wherever we look, nobody who claims to see ahead should be believed. We can and must, however, consider risks. To sum up, the hard right is our most pressing menace. We need a common front of centre, liberals and left to stand up against it. They need to recall how much unites them and set aside what divides them, not blur, suppress or forget, but set aside. I’ve not the least practical advice. I can’t say which way to turn at the bottom of the street. If what I’ve said sounds over-general or over-abstract, my defence is that broad ideas count in politics. They work slowly out of sight, but they shape the landscape. If what I’ve said is itself passionate and angry, well, yes, it is. Conservatives echoing Burke taunt liberals for exaggerating the scope of reason in politics. They can’t complain when social passions are redirected back at them. If it is objected that I too have singularised an enemy, I plead that unlike the hard right I have not conjured up an imaginary Other but identified a genuine adversary in a struggle over democratic liberalism that is already engaged. Karlsbad. 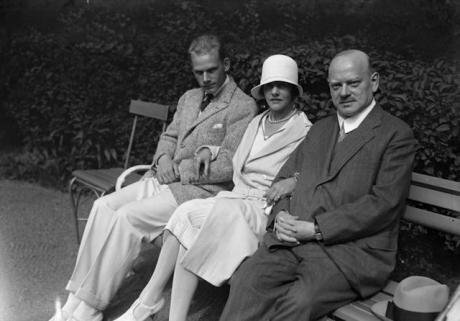 Gustav Stresemann in September 1929 shortly before his death with his wife Käthe and son Wolfgang. Wikicommons/ German Federal Archives. Some rights reserved.